Psd templates are very versatile in technology based business such as hosting, app landing page, web design, ticket support, software promotion and many other segments of technology based services and businesses. Moreover, PSD templates are highly adaptable and comes in layers grouped together in .psd format which is by far the most popular format for storing images. Saving as layered images is preferable as one could easily edit different parts of an image later. Any program that supports PSDs directly can then leverage this layer information. Photoshop can easily convert PSD files to other formats such as PNG, JPEG, TIFF and BMP. The color combination and the ease of use in customizing these technology psd templates make these a superior collection of web templates. Check out our collection of “ PSD Templates in Latest Technology” and give your feedback. Thanks. Mega – Hosting, Software Promotion PSD: Hosting, Application or Software promotion PSD Theme. Clean and Flexible design also suitable for multipurpose websites. We will add more variations soon! Delicious App Landing PSD Theme: A Mobile App Landing PhotoShop PSD Theme with clean and modern style one page design. This template design includes features, reviews, screen showcase, video demo, support contact and more. Delicious is a perfect mobile app showcase for iPhone, Android and other mobile devices. Features: One Page Layout, 3 Color Themes Included, 1120 Grid Based, Clean and precise design, Opens with PhotoShop CS, CS2, CS3, CS4, CS5, CS5.5, CS6, CC. OptimaSales Business & Technology Template v2.1: Absolutely new version of OptimaSales PSD template is revamped from the scratch in version 2.0. Now you get absolutely new refreshed business & technology PSD template with better user experience. OptimaSales is a pixel perfect and clean PSD template created with modern technology in mind. This template contains of 24 PSD files and 3 AI files. You’ll get all possible ways to edit it and customize due to your needs. This template is design based on Bootstrap 3 grid (1170 PX) so it can now meet the latest web requirements. To make your site appealing, you get wide range of pages along with specially tailored illustrations and patterns in OptimaSales style. So OptimaSales goes with 3 unique and stylish homepages which are filled up with authentic set of illustrations and icons. There are also two alternative logos which can be used for your project. These visuals can be easily edited in Adobe Illustrator or other vector editors. Moreover, OptimaSales helps you not only create new professional looking website, but also save your time and money, as it comes with valuable extra graphics. OptimaSales has also specific pages for technology website such as: How It Works, Services, Pricing, Support, Login, Registration. There are also pages which can be used for corporate website or personal vCard such as: About, Our Team, Single Employee, Contact (with fully designed states for success or failure). As any modern sites OptimaSales provides you with ability to create portfolio and blogs. This template has 5 versions of Portfolio and Case Study page. To help your news and articles stand out from the crowd and perform high readability you get unique and meticulously created blog pages such as: Blog Fullwidth, Blog with Sidebar, Single Post Fullwidth, Single Post with Sidebar. Foxuhost – Hosting / Business Template: Foxuhost is a Pixel Perfect Hosting and Multipurpose PSD template with 62 fully layered PSD files for Hosting, business, agency, portfolio, creative and other websites. Foxuhost Features: 62 fully layered PSD Files, 7 Different Layouts, 55 inner pages; Bootstrap 1170x Grid, Beautiful Color Options, Blog Pages, Beautiful Elements, Pixel Perfect and Multipurpose design, well organized layers makes it easy to edit. Seven Host – Hosting PSD Template: Seven Host is a clean , modern and creative Hosting PSD Template for your Web Hosting Business, a creative agency, Technology Websites or any company website!. The PSD files are fully layered and customizable and all elements are in groups and can easily identify by the group name as well to help you make changes in the page structure of the template and also to build your own demo. We also add awesome elements & Short codes. Seven Host designed especially to suit almost all projects so you can customize your website as much as you want; you have tons of layout possibilities with unlimited variations and colors. Allec – Business & Technology PSD Template: Allec is a business & technology PSD template. It’s a perfect combination of modern design and unique authentic look. Allec is designed with the flat concept with muted color scheme in mind. It’s fancy and functional at the same time – you get a lot of slick elements to stand out from the crowd as well as different pages for various purposes (corporate, technology, shop, forum, app, blog, landing page or agency etc.). Allec is a multipurpose PSD template. This template is fully editable and can be easily customized to your needs. As Allec is a template from technology category, it has a lot of features suitable for a technology website. There are 3 different services pages and single service page. You get support page too. It’s important feature for technology website to have ability to provide support to their users with thought-out UX. Pricing tables are also included and are designed in different styles to give you the possibility to choose the one that suits the best for you. It is very convenient especially for hosting websites or cloud services providers to show their pricing plans. Btw, Allec has hosting homepage which is designed especially for hosting providers. As a technology based website, you may also need a dashboard or some sort of admin panel. Allec has such kind of pages as well. Dashboard page is full of various types of charts and stats, calendar and notifications to suit well to the rest of Allec pages. Allec PSD template can be also used as a landing page or to promote your application. For this purposes there are 5 different homepage designs. 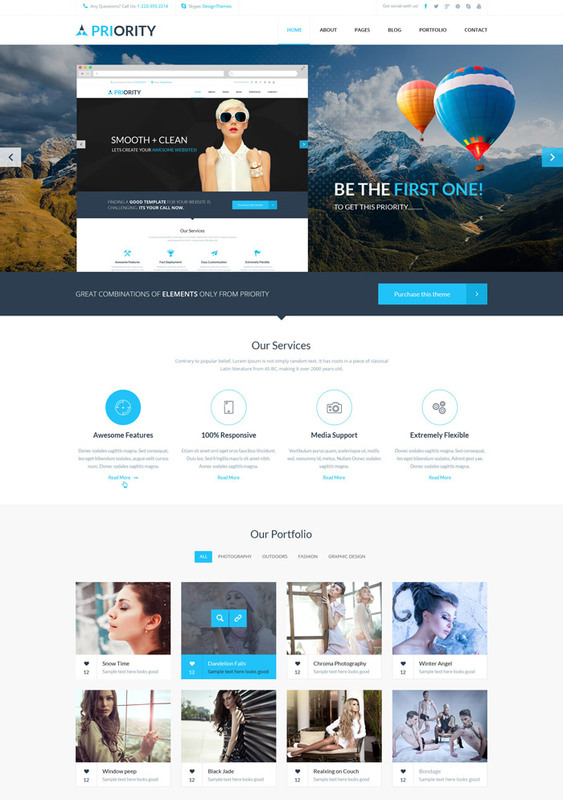 Onepage version is also designed for Allec PSD template. These pages are suitable for web agency as well. This PSD template is perfect match for corporate site too. As it has everything you need. Allec has different kind of pages such as about, single employee, careers, testimonials, 4 contact pages, 4 types of portfolio and case study. Allec has also full pack of e-commerce pages from homepage to checkout process. Besides these pages Avalon offers you 2 pages designed for forum. Our template has pages variety which depends not only on content and purposes, but visuals as well. Allec goes along with light and dark versions. Along with predefined pages you get huge amount of components/shortcodes designed to satisfy any customer. Allec has also big variety of headers and footers options to make different combinations of them. The download includes 84 well organized PSD files, which enable you to either create a stunning layout of your own or just do some minor adjustments! Check out the screenshots to see them all! VERY IMPORTANT! We’re still working on this template, so you’ll get new updates with new features absolutely free. GeekApp – One Page App Landing PSD Template: GeekApp is a modern, unique and clean Single Page PSD template suitable for mobile, iPad App website. Template is fully editable and well organized layers. You can easily change its color, shape & font style. Features: 10 PSD with Color Options, Clean & Professional Design, Easy & Customizable Psd files, Free Google Font. Omni – Onepage app template: Omni is an Onepage creative template designed in a clear and modern style. Perfectly suitable for applications, devices, software, development, promo companies and for landing pages as well. You will find many uses for these templates. The PSD consists of well-organized components – so it’s easy to modify and customize everything. Template features: 11 Full layered psd files, 3 Home styles, 3 Blog styles, Portfolio pages, Based on 1170px total grid width, Cute and Modern Style, Clear and Clean Layout, Fully Customizable, PSD is fully layered and organized with proper names, Fully Customizable. AppBox: AppBox is a Mobile App / Product / Startup Responsive Landing Page PSD Template with clean and modern style & design. It includes App / Product Features, Reviews, Showcase, Video Demo, Support, Blog, Contact and Shop / Online Appstore pages (added soon). AppBox is a perfect mobile app showcase with lots of features. This PSD Template comes with 8 fully layered & easily editable PSD files that are well-organized in layers & groups. NRGhost Description: NRGhost is a powerful, modern and creative psd template for Hosting, SaaS Websites and other similar nature of websites. The psd files are fully layered and customizable. All elements in groups and can easily identify by the group name as well. Template Features: 19 Full Layered PSD Files, Based on 1170px total grid width, Cute and Modern Style, Clear and Clean Layout, Fully Customizable, PSD is fully layered and organized with proper names and Pixel Perfect. The structure of each psd file is a clear and logical. All major blocks of pages in groups and highlighted for easy.